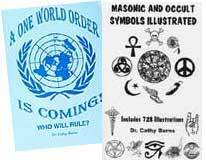 WAS ANTICHRIST'S "COVENANT" CREATED DURING THESE THREE U.N. MEETINGS IN NEW YORK CITY THIS PAST WEEK? Title: WAS ANTICHRIST'S "COVENANT" CREATED DURING THESE THREE U.N. MEETINGS IN NEW YORK CITY THIS PAST WEEK? Subtitle: The scenario we envisioned has so far been carried out: the entire world covenanted on Jerusalem -- including the Israelis -- except for Palestinian leader Yassir Arafat. Stage now set for planned World War III to produce Antichrist. NEWS BRIEF: "Yassir Arafat leaves New York City to return home", Arutz-7, Friday, Sept 8, 2000. "Yassir Arafat returns to Gaza from New York today, putting an end to speculation that a dramatic breakthrough might still occur during the Millennium Conference. Prime Minister Barak evaluates the chances of reaching a final-status agreement with the Palestinians at 50-50, and for the first time expressed a willingness to sign a partial agreement that would not include Jerusalem. Arafat objects to this, and has even reneged on agreements regarding settlements and refugees that were reached in Camp David." We know from the House of Theosophy Seminar of 1991 [NEWS1052] that these three United Nations Millennial Summit meetings just concluded in New York City were being held for the express purpose of creating enough global "psychic energy" to force a covenant on the issue of Jerusalem. The Illuminati gave this covenant a name, The New Jerusalem Covenant. Mr. Lambert served three years in Jerusalem and Europe on a committee entitled, The New Jerusalem Covenant Project . The very fact that these three global conferences were held concurrently, even simultaneously, tells us that the plan agreed upon by this committee is being followed, likely to the letter. We believe it highly likely that this covenant was agreed upon, and created, last week. The entire world, including the Illuminized Israelis, agreed to sign this covenant; only one man refused to sign this covenant -- Yassir Arafat. Toward the end of this article, we shall state the reason why the scenario seems to call for him to be the lone holdout. But, for now, let us examine some of the points this New Jerusalem Covenant Project might contain. 1. Both Arabs and Jews would retain right to their present worship sites -- At this Summit, Arabs warned that "No Moslem has the right to cede Jerusalem or the holy places." [Egyptian Mufti Nasser Vassel, speaking on behalf of Egyptian President, Hosni Mubarak]. The Israeli position was was equally adamant, as espoused by Prime Minister Barak. ""Jerusalem and the Temple Mount are the cornerstones of Jewish identity. I made it very clear that no Israeli Prime Minister will ever be able to sign a document that will give up sovereignty on the Temple Mount..."
As the scenario demands, Arafat and Barak were on opposite sides of this issue, with Barak sounding reasonable and Arafat unreasonable. The Jerusalem Post reported on Sept 7: "Israeli Prime Minister Ehud Barak took the world's stage yesterday at the UN Millennial Summit and, after reiterating the centrality and importance of Jerusalem to the Jewish people for the last 2,000 years, also acknowledged that the city is cherished by our Palestinian neighbors. 'We recognize that Jerusalem is also sacred to the Moslems and Christians the world over ... A true peace will reflect all these bonds'. He pledged that Jerusalem will 'remain open and united to all those who love her'." Arafat, on the other hand, refused to reciprocate. He even refused to admit that the Jews had any historic or religious claim on Jerusalem! He accused the Israelis of trying to "Judaize" the city, he called the city the "cradle of Christ" [thus revealing his Biblical ignorance], and proudly affirmed that Jerusalem was the point of entry into Heaven for the prophet Mohammed. But, he steadfastly refused to acknowledge any Jewish claim on either Jerusalem or the Jewish holy sites. 2. Jerusalem would become a Unified, International City, under United Nations Control -- Mr. Lambert, the New England Director of the House of Theosophy, made this goal crystal clear during his seminar in August, 1991. More recently, others have been making this proposal. The Pope recently issued a call for the Internationalization of Jerusalem. 3. Jerusalem has even been proposed as THE World's Capitol! This startling statement was made by none other than a top, trusted lieutenant of Yassir Arafat, Ahmed Qureia, the speaker of the Palestinian Parliament. He said, "Unless we can reach an agreement on Jerusalem, I have to declare that both parts of Jerusalem east and west should be a unified international Jerusalem ... not just the capital of Israel or Palestine, but a capital of the world." ["Jerusalem should be a unified world capitol", the Guardian Observer, http://www.guardianunlimited.co.uk/Distribution/Redirect_Artifact/0,4678,0-364943,00.html written by Suzanne Goldenberg in Jerusalem, September 6, 2000. If Jerusalem is proposed as a World Capitol, a World Government under the auspices of a World Ruler are unmistakably implied. Indeed, this is the ultimate plan. Also, do not be deceived into thinking that, just because this statement of Jerusalem being the World Capitol was made by one of Arafat's top trusted lieutenants, that Arafat will ultimately embrace just such a plan. Arafat is playing the role of spoiler here, so that Antichrist can point to his spoiler role after he emerges from the planned World War III as THE prime example of the devastation one man can produce. But, we are getting a little ahead of ourselves here. Arafat is refusing to agree because that is his role assigned him by the Illuminati, and because he personally believes this is the role he should play. As we have repeatedly stated, Arafat is following the instructions of the Prophet Mohammed as to how to deal with an enemy more powerful than the Muslim. First, you make peace; while peace is being established, you encourage the enemy to become complacent, even to the point of decreasing their arms, while you are arming yourself to the teeth; finally, when your rearmament plans are completed and your enemy is complacent, you attack and destroy him. This is Arafat's plan, and it is the plan that will produce the war designed to stage Antichrist. Thus, we believe the New Jerusalem Covenant was created, ratified, and even possibly signed by key delegates of the assembly of the Political Conference which met from September 6-10, in New York City. The lone hold-out was Palestinian leader, Yassir Arafat. At this point, the scenario for the planned Third World War to produce Antichrist kicks into high gear. [Read NEWS1015 for full details]. Briefly stated, Masonic leader, Albert Pike, received a demonic vision on January 22, 1870. This demon told Pike that three (3) world wars would be necessary to produce Antichrist. Pike must have been surprised by this revelation, because the world had never, ever experienced a world war. Many of the wars in mankind's bloody history had been mighty large, but no war had ever been fought that involved all continents before. The First World War was to be fought in Europe, with the primary goal of overthrowing the Czarist Government in Russia, replacing it with Communism [a theory only, having been published in 1848 by Satan worshipper, Karl Marx]. History tells us this goal was accomplished perfectly. The Second World War was to begin between Germany and Great Britain, but the primary goal was to build Russia up to superpower status. History tells us this goal was accomplished perfectly. The Third World War was to begin between Israel and her Arab neighbors, and out of the smoke and conflagration of this war, Antichrist was to come striding. Pike must have been shocked by this revelation, because, in 1870, Israel did not exist as a nation, and no human foresight could have foreseen that she would ever come back to her land as a nation. In 1870, the Turkish Ottoman Empire was firmly in control of the Middle East and showed no signs of ever giving it up. In fact, the only people in the world who were dogmatically saying that Israel would return to her land as a nation one day were Born Again, Fundamentalist Christians who were taking this stand based upon End Times prophecy in God's Holy Word. History demonstrates that the first two world wars occurred exactly as this demonic vision to Albert Pike foretold; current events demonstrate that the war-trigger is set, ready to explode in fulfillment of the Third World War demonic vision. Yassir Arafat has armed his Palestinian "Police" with powerful regular army weapons, he has trained them in regular army tactics, and he has entered into agreements with Syria and Egypt that calls for these two countries -- and possibly Jordan -- to attack Israel once the Palestinians have drawn regular Israeli Defense Forces into the middle of Israel. At this point, the little-known prophecy of Obadiah 15-18 is fulfilled, as the Houses of Jacob and Joseph [Modern-day Israel] will completely annihilate the Palestinians [House of Esau] man, woman, and child. We have written on this subject in NEWS1123. Shortly after this conflagration begins, the war continues to go truly global, just as the Plan calls for. Even China may get in on the act, possibly in defense of North Korea. [Ibid.] However, since China was promised Taiwan back by the Illuminati in 1952 [Read NEWS1282], we find it highly likely that, soon after America has committed all her forces to the Middle East and to Korea, China will simply launch her attack against Taiwan, possibly using her unconventional weapons, most notably her HAARP Particle Beam weapon so as to lessen her losses in fighting for the island. As soon as the war spreads globally, all the stock markets in the world will crash. People all over the Industrialized World, who thought they were set for life because of their investments, will find themselves totally bankrupt. People will panic badly. Those who never saw this war coming will rush to the grocery stores to empty the shelves, causing even greater panic from those people who did not get any food because shelves were emptied before they got there. Because America is backing Israel in this war, and because Israel is annihilating the Palestinians, the armies of Syria, Egypt, and Jordan, the Arab OPEC states will announce a new Oil Embargo. This embargo will hit with full force, since Illuminist President Bill Clinton has spent his 8-year Presidency systematically shutting down our domestic production. Economic panic will grow worse, and riots will begin to occur in some of our cities. Arab terrorists will also begin threatening American cities because of our support of Israel. In fact, Arab terrorists will threaten our cities with nuclear warheads, adding greatly to the panic. At this point, Janet Reno will have received her full authority over all paramilitary and police forces in America [Read NEWS1361 for full details] under the Executive Order issued recently by Clinton. She will move aggressively to attempt to restore order. In the midst of all this planned chaos, war and destruction, Americans will willingly close their eyes when President Clinton promises them he will restore all these lost liberties once he has "quelled the enemies of peace and tamed all parties". If the Illuminized Press were to ever have the gall to ask him the time frame he anticipates when Americans might get our freedoms back, he will likely remember this last sentence from the Protocols. He might say, "With all these terrible crises against which we are fighting, 'it is not worthwhile to say anything about how long a time' Americans will have to live without their liberties". At the moment President Clinton is abolishing all the freedoms too many Americans have either taken for granted, or who have sacrificed its ideals on the altar of expediency and material gain, our cities are on fire and no amount of paramilitary and/or police forces can restore order. Finally, after weeks of outright combat in our largest metropolitan centers, the President stands in front of the TV cameras again, looking even more somber. He intones that much life and property has been lost to the mobs ruling the streets, and all of our military units are out of the country, either in the Middle East or in Korea. Therefore, Clinton will inform us that he is turning to the United Nations for assistance in restoring order to our cities. At this moment, those thinking Americans will remember well a remark by Henry Kissinger during the time of the Rodney King riots in Los Angeles, a comment that seemed too ludicrous to be serious at the time. Kissinger said, "Americans would be outraged if U.N. troops were to land in L.A. right now to restore order, but the time is soon coming when they will welcome such troops". You will find the explanation for this plan of foreign occupation of the United States by reading NEWS1270. Read the plan to discover what foreign troops with whom you will have to contend in your area. At this point, the United States of America is divided into five regions, all of which are under the jackbooted heel of hardened foreign troops. THE BIRTH OF ANTICHRIST IS FINALLY COMPLETE! Suddenly, seemingly as a result of this superman's power and influence, all the wars, all the riots, and all the chaos engulfing the world suddenly stop! [Of course, since the leaders of the world have started these terrors as a means to get this man on the world stage, it is not hard to get all the horror to cease!] But, the peoples of the world either cannot or will not see the Unseen Hand pulling all the strings on the puppeteer stage, so they believe this superman is God, just as he claims. Unbelievably, the businessmen of the world rally behind this superman, and announce their confidence in him. Since 90% of the fuel that sparks the world's stock markets is investor confidence, the stark markets will be erected once again, and will begin to explode in value, but this time as a global stock market, with a global currency. Prosperity will be restored! The last group in the world to be convinced are the Jews, who see him "fulfilling" the last of the Messianic prophecies. Finally, they declare him to be Messiah. He will step to the stage, look into the microphone, and say -- among other things -- "we have seen the horrible effects that the obstinacy of one individual can have on the world community. In August and September, the entire world was united on a solution to the problems of Jerusalem, authorizing a New Jerusalem Covenant that would have solved all the problems for Jews, Muslims, and Christians alike. Everyone was willing to ratify such a plan, except for Yassir Arafat. His stubbornness has cost millions of lives and untold damage. I personally guarantee this kind of situation will never happen again. I will use my supernatural power to ensure it will never happen again. At this moment, I will add my signature to those of all the leaders of the world to make Jerusalem an International Capitol of the World; I will confirm this covenant." He places his signature on the document. At that moment, two things will immediately happen: First, the 7-year Tribulation Period will begin, that very hour; secondly, people the world over will say to themselves and to others, "Finally, we have Peace and Safety", thus enacting the terrible judgments from God as the Apostle Paul foretold in 1 Thessalonians 5:1-3. The world now stands at the cusp of this entire terrible scenario. Sometime before Antichrist "confirms the covenant", the Church of Jesus Christ will be Raptured. But, we may have to endure this Third World War scenario designed to produce Antichrist. "All this [signs] is but the beginning, the early pains of the birth pangs of the intolerable anguish". In other words, the signs of which Jesus told in verses 4-7 are birth pangs. Now, you ladies can correct me if I get this wrong, but during childbirth, the pangs get stronger and closer together as the actual birth gets closer. The birth pangs are the strongest, and the most painful, just before the child is actually born! Now, in this instance, Jesus Christ Himself said that the process of the Antichrist appearing [verse 15 places him in the newly built Temple at the mid-point of the Tribulation Period] is like a woman giving birth! When do historians place the official beginning of Israel returning to her land? Most of them point to the Balfour Declaration of 1917, where Great Britain committed her resources to aiding the Jews in getting their ancient land back. Even while the First World War was still being fought, Britain placed the enormous resources behind the concept of Israel coming back to her land. We are now 83 years later, with the Second World War behind us, and thousands of wars and rumors of wars later. We believe the world is exceedingly close to the appearance [birth] of Antichrist. Therefore, we should expect that the birth pangs of which Jesus foretold would get so powerful they would give birth to the Son of Perdition! In other words, the baby cannot be born unless the latest birth pangs are the strongest. What birth pangs did Jesus foretell, in verses 4-7? * Unparalleled Deception -- Jesus warned three (3) times of this unprecedented level of deception, foretold in verse 24 that it would reach such a high level that, if possible, even the elect would be deceived. Sadly, this demonic spirit of deception has reached such unprecedented levels that the vast majority of "Christian" churches are now in deep apostasy, fraternizing with the religionists of Antichrist. Many churches and "Christian" schools are even now finding excuses for children and adults to read Harry Potter, the most deeply Satanic writings ever to find broad acceptance in the English language. * Famines and earthquakes in many different places on the globe, and numerous ones virtually in unison at different points on the globe. Unparalleled deception, wars, rumors of wars, kingdom fighting against kingdom, famines and earthquakes. These are the birth pangs of which Jesus warned, which is why the 20th Century has been so very bloody and so full of tensions and trouble. Therefore, we can expect one last final push, where each of these signs are wrenching the world at once. This is exactly where the Illuminist's World War III scenario fits in the final picture, the final push that gives birth to Antichrist, that allows him to stage his appearance on the earth. This scenario satisfies the Biblical prophecy and it is the Plan of the Illuminati to stage Antichrist. Will the Christian Church see these final terrible birth pangs that finally produces Antichrist? I think it likely we will. We at Cutting Edge Ministries fervently believe in the Pre-Tribulation Rapture, which means we are out of here before the Antichrist convinces the Orthodox Jews he is their Messiah, an event which will allow him to "confirm the covenant". The 7-Year Tribulation Period begins the second Antichrist "confirms the covenant".